Knorr OXO Beef In-a-mug adds great flavour to your cooking. It will add a bold new taste to your next meal and is delcious as a hot beverage too. 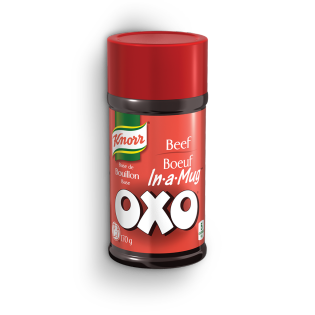 Knorr OXO In-a-mug bouillon is easy to use, quick to dissolve and adds rich deep flavour to your soups, stews, sauces, gravies, risottos and stir frys. Salt, corn syrup solids, monosodium glutamate, autolyzed yeast extract, colour, flavour, onion powder, modified corn starch, lactic acid, canola oil, beef extract, disodium guanylate, disodium inosinate, maltodextrin, spices, hydrogenated soybean/cottonseed oil, soy sauce powder (soybeans, wheat, salt) and sulphites. May contain traces of milk ingredients. For each cup (250 mL) of boiling water, add 1 tsp (5 mL) of powder, or sprinkle directly into your food while cooking.